Meet Kane. 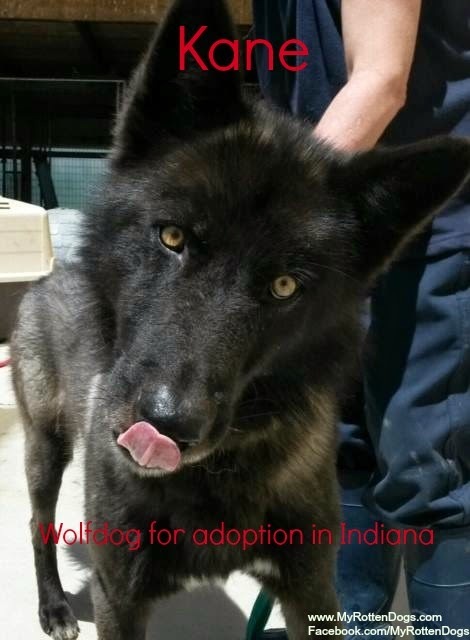 Kane is stated to be three years old (though I feel he might be a bit younger), and is a lower-mid to mid content wolfdog available for adoption in Indiana. Kane was picked up as a stray, and officially became an owner surrender because his owners could not afford to "bail him out." I went to meet and evaluate Kane. He is a pretty lovely boy, whom I would probably adopt myself if not for Bruce. According to his original owners, his predominant dog breed is Akita. I personally did not see it, but did see heavy GSD influence. He loved human attention, and seemed quite well-adjusted for a wolfdog in a shelter environment. According to the shelter staff, he is very food motivated. Imagine that. He does need to put on some weight. He walked pretty well on a leash. His one downfall is that he was pretty rude/bossy when I observed him greeting another dog. Ears up, chest out, tail high and proud. So he might not do well in a home with another confident male. Kane is a black phase wolfdog, and this photo shows some of his phasing. He is a proven escape artist, and will need tall, secure fencing. A home check will be required prior to his adoption. He is currently being housed at a shelter, but is in no risk. Keep in mind that wolfdogs are illegal in some states, including two of my neighbors, Illinois and Michigan. Even if your state is legal, some counties, towns, and localities may deem them illegal. Some transport assistance may be available. If anyone is interested in adopting Kane, email me at contact (at) myrottendogs (dot) com. If you think you know someone who might be interested in adopting a lovely young male wolfdog, share this post. Thank you! He is stunning! His eyes are so captivating. Kelsie, I know. It was hard not to bring him home the day I went to evaluate him. He seems like an amazing dog! I hope he finds a great home! Well he's quite handsome! Love the dark coat with those eyes... good luck to him! He is GORGEOUS!!! I wish I could adopt him! Sharing! What a beauty! I will share him and hope he finds a home.